The country of Costa Rica is sandwiched between Nicaragua and Panama and is home to dense jungles, surfing beaches, cloudforests and volcanos. This area is one of the most biodiverse on Earth and is leading the effort on sustainable tourism. The country also tends to be relatively less expensive when compared to the nearby Caribbean Islands where the dollar doesn’t go as far. The two itineraries highlighted below cover Costa Rica’s interior and Pacific Coast. So whether you want to get up close to sloths and tree frogs on an eerie night walk in Monteverde, raft the class five rapids of the Rio Pacuare, sun bathe with monkeys in Manuel Antonio, enjoy exotic birdwatching at an eco lodge in the Osa Peninsula, or just alternate beaches in Guanacaste, this Roam Guide should offer a wonderful place to start planning your Costa Rican adventure. Since Costa Rica is a tropical country close to the Equator, it is often characterized as a very humid rainforest. Warm temperatures with highs in the 80s and lows in the 70s are pretty standard year-round. It has two well-defined seasons: a "dry" season from December to April and a “rainy season” from May to November (the rainiest being September and October). During this time, it will rain three to four times per week, but primarily late afternoon and evening. If you want to save costs, May and June are a wonderful time to experience the magic of the rainforest without the high-season tourists and price tag. Co-founder Regina has taken several multi-generational vacations with her extended family over the years and considers herself very fortunate to have had that opportunity. She’s always found the time traveling together not only enjoyable but essential to maintaining relationships with her adult brothers and very beneficial to her children’s understanding of family and culture. The group has been deliberate in their choice of destinations in order to find something for everyone to appreciate, and the two weeks they spent in Costa Rica was no exception. Traveling together with her husband and two children (under 10), were her single brothers, both in their 30s, and her father 65. The varied landscape, multitude of activities, and rotating cities allowed for constant entertainment, conversation and adventure. When attempting a lengthy and well rounded visit to any country, it’s important to not just have structure but flexibility. We flew in and out of San Jose airport (SJO) planning interior flights to visit the Southern Pacific beaches as well as the Oso Peninsula. We book-ended our trip with two nights in San Jose, and otherwise spent 4 nights respectively in La Fortuna (Arenal), Quepos (Manuel Antonio) and Puerto Jiménez (the tip of the Osa Peninsula), and in that order. We worked with Coati Tours for the arrangements and hired a driver for the 3+ hour drive to to Arenal from San Jose. Our trip took place over two weeks in January. We flew United from the US, and our preferred airline for interior flights was Nature Air. In San Jose, we stayed at Hotel Grano De Oro, and would stay again in a heartbeat. The restaurant, the quaint meandering hallways to each room and the rooftop hottub, all being good reasons to do so. This hotel was especially nice during the holidays and the gift shop was the best I found during our stay in Costa Rica. Rtip: an alternative to staying inside the capital city of San Jose is to consider nearby, Finca Rosa Blanca Coffee Plantation and Inn. The property is part of Cayuga Sustainable Hospitality and is a great alternative in the area for under $300/ night. From San Jose we moved to Arenal where the priority was to stay at a property with onsite, private hot springs. We chose Hotel Arenal Kioro, with it’s impressive welcoming lobby, lush grounds, oversized suites and top notch views of the volcano. Although the hot springs we’re not feeding properly during our stay and the food was mediocre, I would stay there again. If I was to consider an alternative, I would look at Tabcon Grand Spa and Thermal Resort or check out Both options are affordable and relatively removed from the tourist center of La Fortuna, but near enough for variety as it pertains to meals and activities. Next we headed to Manuel Antonio where we stayed at one of my most favorite properties in all of Central America, Arenas Del Mar. We had a hard time leaving this resort, with the isolated beach front, lovely staff, great food, expansive rooms, views and privacy. My kids literally sat on the steps on the last day and pouted. Rtip: We have friends scheduled to stay at The Tulemar Bungalows & Villas this Winter and I have heard wonderful things about this option and they offer villa accommodations that sleep up to 10 guests in Manuel Antonio. The final days of our trip were spent at this remote eco lodge on the Osa Pennisula. Established by a couple from Minnesota, this was a bucket list resort for my Dad, who did not steer us wrong. With only 17 bungalows across a 1000-acre private Rainforest Reserve, this is my kind of all-inclusive experience. Not only were our meals a stellar example of authentic, delicious and fresh “farm to table,” but we were “included” in much more than a meal plan. We were honored guests in the habitat of the primary and secondary rain forest. In fact I had to waive liability for my responsible, albeit a bit younger son while staying on property. Every day we awoke to howler monkeys, crossed paths with sloths, sun bathed with lizards, avoided snakes, and marveled at exotic birds. Together we enjoyed wonderful adventures, while we also gave each other permission to break from the group. We designed a menu of activities from which everyone could pursue their own agenda. While Dad kept the kids busy in city center San Jose, the adult children rafted the rapids of the Río Pacuare. While some enjoyed a cup of Costa Rican coffee after a medicinal herb tour through the jungle, others drank wine in the thermal hot springs under the shadow of Volcán Arenal. Together we enjoyed a lengthy hike across suspension bridges and planted trees under the canopy of the rainforest. We spent equal time spent rolling cigars and visiting a butterfly garden. All ages, Pura Vida. In San Jose — we took a day trip to raft the Class III and IV rapids of the Pacuare River. We booked through Rios Tropicales and it was an amazing adventure that included 19 miles on the water past waterfalls and towering jungle foliage. Snacks, lunch and round-trip transportation included. This outfitter also offers river rafting in Arenal, Manuel Antonio and Guanacaste. Rtip: is to spring for the professional photographs that are taken along the river, and remember to bring cash to grab a beer when you’re done. It’s worth mentioning that just outside San Jose (on the drive to Arenal) you’ll find a number of unique experiences and activities. We found the cutest most authentic cigar shop you can imagine. It’s called The Cigar Shop in San Ramon where you can roll your own cigars with the owners, who also customize gifts and ship to the US. Additionally, there is a very notable coffee plantation, Espiritu Coffee Plantation in the town of Naranjo - where most of the regions coffee supply is produced. Your driver can stop or you can take a day trip to the plantation. A second coffee plantation that was recommended to us was, Doka Estates. And finally, if you have kiddos in tow you must stop at El Cocora Butterfly and Hummingbird Gardens. In Arenal — there are an abundance of adventure seeking activities like repelling down a waterfall, kayaking at Arenal Lake, or spelunking at Venado Caves. Instead, we opted for zip-lining and suspension bridges, so that our group could spend the day together. At Arenal Park there is a Sky Tram that the kids could ride while those of us who were old enough to participate, could experience the extreme 7 point, Sky Trek ziplines, with impressive height and speed and no walking required. The suspension bridge hike in Mistico Park is 2 miles across several hanging bridges within a private nature preserve. For $26 you can take your time on a self guided hike and for an additional $12 they offer a naturalist guided tour. Just don’t miss the waterfall at the end of the trail. Rtip: Stop into the gift shop after ziplining to purchase Costa Rican coffee and a souvenir of hematite magnetic stones. Not kidding, they are a huge a hit with all ages and something we wish we had bought more of. In Manual Antonio — we took the opportunity to do a little less. My kids are more than happy just to swim all day so we took advantage of both the private Playitas Beach, and Playa Dulce de Vida (Sweetness of Life) on the northwest side of nearby Espadilla beach. We did however make time for a guided tour of the tucan, sloth and howler monkey filled National Park, where we had a chance to swim the two beaches on the edge of the National Park. Just beware, the monkeys are sneaky thieves and will steal anything you leave unattended. One day while it rained, we learned to make homemade tortillas with a local woman at the resort. While we enjoyed meals exclusively on property during our time in San Jose and at Lapa Rios, we did eat out during our time in Manuel Antonio. It isn’t the cargo plane that’s sticking out of the front of this restaurant that you need to see, it’s the view from one of their two patios. Festive drinks and seafood dominate the menu and the vibe is super casual. It doesn’t have to be sunset for you to enjoy this hot spot, halfway between the national park and the city center but they do boast the best sunset view around. Touting the best Italian in Costa Rica, this place was so good we ate here twice. The live music, excellent wine list and friendly staff were a nice compliment to the delicious gourmet pizza and pasta. I still think about the spicy meat lovers pizza, the homemade bruschetta and the dinner salad filled with hearts of palm. We went here for my son’s birthday so while we may have chosen the restaurant for the menu’s hamburgers, it was the fish tacos and the drinks that stole the show. They have a great patio and the service was lovely. It was fun to venture into town for a meal. Rtip: If you have a chance to try the pejibaye fruit (pronounced pay-hee-by-yay) available at stands or in soup, it’s a must try food in Costa Rica. It tastes like a cross between roasted chestnuts and a perfectly buttered baked potato and it’s delicious. Luggage restrictions on domestic flights are 25 pounds per person but there are a few items I would consider essential, including comfortable waterproof walking shoes, socks that go up over your knees for rainforest hikes, a headlamp, sunscreen, binoculars and a refillable water bottle. Additionally I would suggest moisture wicking shirts and some gold bond powder to put between your sheets if you are staying in a non air-conditioned eco-lodge. There are no immunizations required to enter the country and no preventative medications needed for mosquito related illness. I did bring bug spray, although the need for use is low, unless you are inland in an area that has flat land and standing water. When co-founder Katie’s kids were little, they spent year after year going to the same quaint beach resort for spring break. Swimming, building sandcastles, collecting shells along the beach, and enjoying afternoon naps in a hammock. She says that those small, sandy, sun-kissed bodies in wet bathing suits will stay with her as some of her most fond memories. However as her kids got older, she and her husband felt is was time to break out of their routine and to do a bit more exploring. Their first vacation with that mindset was to Costa Rica, where they could experience the adventure of hiking and ziplining, visit waterfalls, enjoy thermal waters, spot wildlife, and taste coffee, all without having to give up relaxing beach time and treasured poolside conversation. We flew direct from Minneapolis to the Liberia Airport (LIR), rented a car and made the 3+ hour drive to Monteverde, a remote and tranquil town, best know for it’s unique cloud forest and treetop views. We drove ourselves, but be warned the roads are rough. While it is completely safe and managable to drive yourself, you’ll want a 4 wheel-drive vehicle with a spare tire. For those of you with motion sickness, be prepared for a lot of twists and turns. In 2018 they began to pave some of the roads, which will make it easier to access the area but may mean detours. From Monteverde, we drove another 2.5 hours to Arenal to enjoy the La Fortuna waterfalls, the active volcano and thermal hot springs. From Arenal, we traveled back to Guanacaste to relax and enjoy a few days at the beach in Samara. If you are looking for a more developed beach town you could also stay in Tamarindo, a surfers paradise or the tranquill Playa Hermosa, both around an hour from the airport for easy departure. We stayed three nights in our first two locations and four in our last, Samara. After driving for three hours on rugged roads to Monteverde, this gorgeous property was a sight for sore eyes. Perched on a hill just outside Santa Elena, the Austrian chalet- style buildings and the expansive views were reminiscent of the Sound of Music. We opted to stay in the Chalet, which offers spacious rooms (perfect for a family of four), with floor to ceiling windows and a large deck overlooking the jungle - a great spot for morning coffee, just be sure to order a carafe to your room the night before. Their farm to table restaurant Celajes is delicious, and the balcony overlooking the Pacific Ocean makes you feel as if you are sitting on top of the world. Don’t forget to visit their on-site brewery, Cervezas Artesanales to try their Aurorae Pale Ale and take the self-guided trail around the gorgeous property to see the stream, waterfall and pond. We booked all our tours through our hotel, and if you stay here I would highly recommend it. They are well organized, and the guides are terrific. Rtip: Download the hotel app - you can book tours, ask questions, make dinner reservations, etc. It works like a charm. If you want to avoid a large resort and still be close to town, El Silenco del Campo is a great, mid-range choice. The property has 23 private bungalows that are roomy and clean, my only complaint would be that they are a tad dark - not an issue for us, as we spent very little time in our room. The highlight of this resort is the expansive grounds and private thermal pools surrounded by lush vegatation. Not sure if we just got lucky, but we were alone or with one other family by the pools everyday during our stay, it felt like our own private oasis. They also have a small farm on the property with cows, goats and chickens. They encourage you to wander over and meet the animals and even help milk a cow, our kids did every morning. Let me end with the on-site spa…totally took me by surprise, tucked in the back in a tranquil setting. I enjoyed a massage under the stars and had my own thermal pool to rinse off in when I was done. Heavenly. A private rental in the heart of town and only a quick walk to the beach. We thought this villa was lovely, comfortable and had all the amenities of home. I can’t say enough about the outdoor space here- a small private pool that our kids went bananas over, a large dining space with a grill and comfortable lounge furniture all surrounded by lush, well manicured landscaping. This home sits on large gated grounds - and you can’t gain access to the property unless you have the key. Which we misplaced one day, so hang onto that thing with your life. Although the property owner, Monika is always available if you need her. Rtip: If you’re making your way further up the coast to Tamirindo, take a look at Hotel Capitan Suizo, a contributor recommended boutique hotel. 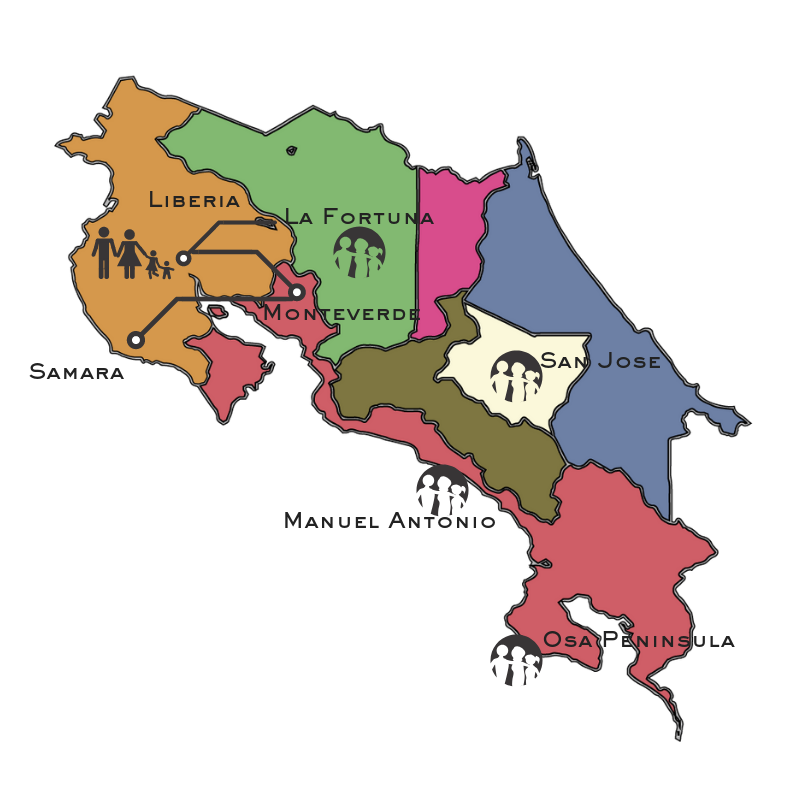 Monteverde is inland from Costa Rica’s Pacific coast, in the Tilaran Mountain Range. It is remote but only about three hours from both of Costa Rica’s international airports. Monteverde is a perfect stop for nature lovers and easy to add to your itinerary if you are visiting La Fortuna/Arenal Volcano and the pacific coast, or visa versa. In Monteverde — we went on a fantastic tour of the Belmar farm, Finca Madre Tierra. We learned how an organic, carbon-neutral farm operates, and how they work with the environment to produce sustainable and delicious food that nourishes and supports the community. We picked coffee beans, made sugar cane, rode an oxen pulled wagon, and enjoyed hot cocoa and cookies. I admit I was a tad a nervous my kids were going to loose interest on this tour but the opposite was true- they loved it, the guides kept them busy and engaged the entire time. Night walks are very popular in Costa Rica and if you take one, you’ll understand why. It’s a unique experience to walk through the cloud forest trails at sunset. We spotted huge stick bugs, snakes, sloths, and a toucan, just to name a few. When the daytime wildlife drifts off to sleep, the nocturnal species awake. You can also hike Selvatura Park, a conservation area with over 850 acres of protected land. Along this tree-top guided scenic hike, we crossed eight suspension bridges and gazed out over the expansive cloud forest. It was an exhilarating experience coupled with great conversation with our kids, something we always appreciate during long hikes. In Arenal — the priority for us was to visit the Arenal Volcano National Park and Observatory, where you can get close to the volcano and even hike the surrounding rainforest. Due to the volcano’s thermal energy, the naturally heated hot springs nearby are unique to the area. I could not pull my family away from these pools of varying temperatures, in fact one night it was pitch dark before we could get them out. You can avoid the large hot springs waterparks by staying at a property with private access to their own springs. Those recommended by both Regina and I in this guide, offer volcanic views and on-site hot springs. That being said, our kids were so into these pools that we decided to go off property and try EcoTermales. We arrived just before it closed and the place was virtually empty. It is very large, so I imagine during the day it is packed. We stayed for an hour and explored the different natural springs, it was lovely to take dip in the cool evening, under the cover of darkness - ok they have lights, but you know what I mean. If you’re in the area, La Fortuna Waterfall is also a must see. You can gain access through the visitors center about 10 minutes outside of town. Although we generally try to avoid crowds, this waterfall is magnificent. My kids loved climbing on the rocks, and wading in the shallow water. Be warned, there are about 500+ concrete steps down to the falls so be ready for some exercise. If you go, bring water shoes, a towel, water and a snack. In Samara — it’s all about the beach. You can visit Playa Samara on foot or drive a little further to explore the lovely Playa Carrillo- or do both. If you are used to having your hotel and loungers right on the beach, be prepared for a different experience. Make sure to pack a beach bag and don’t forget a hat- shade is at a premium. Rtip: bring a backpack to carry your things to the beach. It is a quick walk through town. If you want a loungers or a locker, they are available for rent through Lo Que Hey. Otherwise, grab a seat at a restaurant or bring your own beach towel. From the beach you can explore the town - only a few blocks in each direction. It’s here you can grab a coconut from a local vendor or stop by the Natural Center for a massage, little gelato and to mingle with the locals. When your in Costa Rica, you must make time time for zip-lining through the jungle. Wingnuts Canopy Tour is a family owned business, run by three brothers - all fantastic guides, funny and full of great stories. My son completely froze when he climbed up the ladder and saw the first drop, but our guides expertly distracted him and sent him on his way. The next thing we heard was an enthusiastic “woo-hoo” and from then on, he wanted to go first. In Monteverde and Arenal, we mainly ate on-site at the hotel restaurant. Hotel Belmar has an on-site restaurant, juice bar and tea room. While Silencio del Campo has a dining room and bar area near the pool with drinks and snacks. There were however, two exceptions. In Fortuna, we loved Soda Viquez , where we enjoyed exceptional traditional cuisine and outstanding service. Some say it is the best restaurant in town. In Monteverde, we enjoyed Tramonti Italian Restaurant with its cozy atmosphere and tasty brick-oven pizza. In Samara our home had a full kitchen and grill, so we often grabbed groceries at the Super Samara and ate outside on our beautiful patio. However, we did try plenty of restaurants as well. The town is so quaint and walkable it is hard not to. The following restaurants have been vetted to include the current favorites of Villa Blanca owner Monika. Tacos on the beach, need I say more? We had more meals here then I would like to admit. Great tacos at shaded tables on the beach, which allowed us to watch the kids play while we ate and had a drink. You can also rent chairs here for next to nothing. It’s a great home base when on Playa Samara. This is run by an award winning Italian chef from NYC, the atmosphere is adorable and the food and drinks are excellent. Try the shaken jalapeno margarita, or the pear mimosa but bring cash as they do not take credit cards. This cute little cafe has excellent breakfasts that satisfy everyone- think nutella crepes, huevos rancheros and homemade sausage. They also offer great coffee and baked goods. Sitting above the aforementioned Super Samara on beach road, Samara Sushi was sadly not open when we were there, but is recommended highly by our local friends. We did not want to lug extra bags around on this trip so we were very careful about what we packed. I suggest backpacks if you have them, easier for everyone to transport when you have multiple stops. It’s perfect when one can also double as your beach bag. Hats for everyone, shade is necessary, I really love this one because I don’t have to worry about it getting crushed. River Sandals and bug spray for excursions. Plus we were really glad we had these packable towels for beach hopping, waterfall dips, thermal pools, etc. Click our link here to see everywhere this post recommends you explore in Costa Rica. If you are visiting our site and are using our recommendations, please support our content and our writers by using our affiliate links, which can also found on our resources page. What are we missing? Tell us about your pura vida adventures.